Crockpot Taco Soup is one of my favorite, super-easy meals! 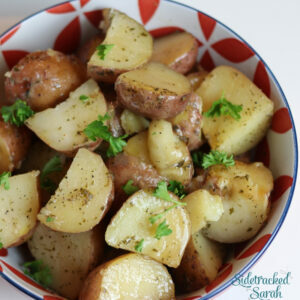 I like to make this in my slow cooker on a regular basis and let it cook all day to let the flavors meld. We add a little cheese on top to make it even more delicious and cheesy. If you were in a pinch and wanted to make this taco soup recipe last minute, you could easily whip it up and have it ready in about 30 minutes, too, by cooking it on the stove. We’ve also made an Instant Pot Taco Soup that is very similar! 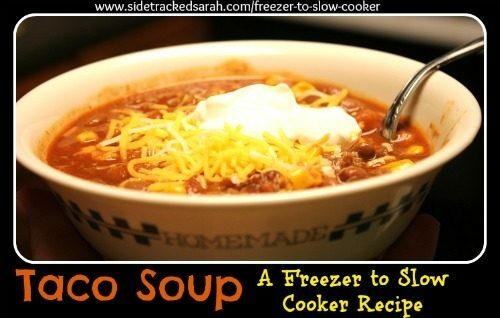 What Size of Slow Cooker Should I Use to Cook my Crockpot Taco Soup? I always make my Crockpot Taco Soup in my 7 quart slow cooker. If you don’t know which slow cooker is best for your family, be sure to check out my post here: Best Slow Cooker Choices and I’ll walk you through the pros and cons of the different slow cookers out there. 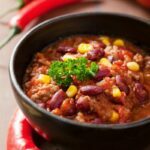 What Should I Serve With Crockpot Taco Soup? We like to serve this recipe topped with cheese, sour cream and Fritos. A side of Southern Cornbread Muffins, also rounds this meal out nicely! My Kids Are Picky. Can I Leave Out the Corn? Yes, you can leave any ingredient out that you want to. However, leaving out the corn makes it very similar to just plain chili, but a little soupier. Yes! 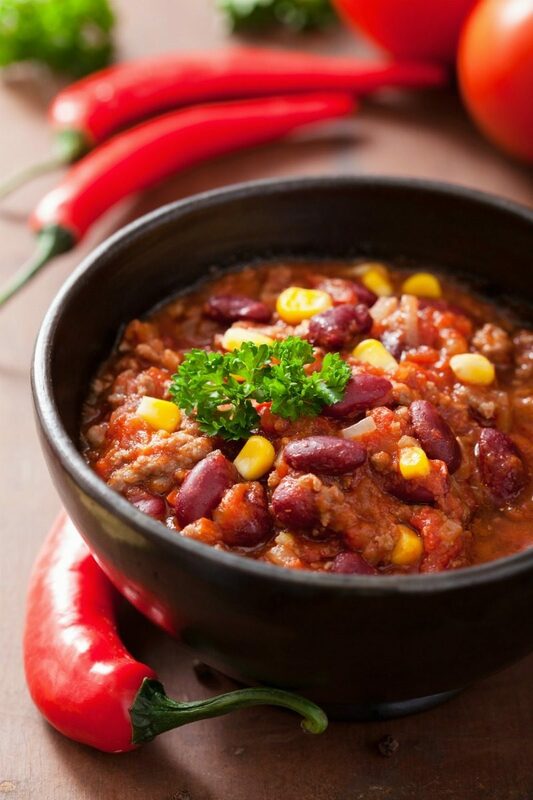 You can freeze taco soup before you cook it or after. I prefer to use a gallon size freezer safe bag and make sure to seal it well so that none of it leaks. Brown the ground beef with chopped onion. Drain ground beef and add to slow cooker. Dump all the cans into the slow cooker. Add water and taco seasoning. Cook on low or high, depending on how soon you need it. For the actual recipe, see below…. Mix all ingredients in slow cooker . Cook in the crockpot for 4 hours on high or 8 hours on low. To prepare for the freezer, place all ingredients in gallon size freezer safe bag. Thaw before cooking. For more Freezer to Slow Cooker Meal Plans, click on the store above. For more recipes, see my one week crockpot recipes here. To see how we built our own dining room table where we eat our meals, see this post. If the Crockpot Freezer Meals have been helpful to you, I’d love it if you’d take a minute to like Sidetracked Sarah on Facebook. Sarah, my family LOVES this recipe! We could eat it every week! Thank you for sharing it! This was really tasty! Thank you for this recipe. I made this in my Cast Iron pot and paired it with cornbread on the side. Simmered in my Cast Iron pot for 30 minutes on heat level 2 on my stove top. If you are wanting this to be less soupy, then use only 1/2 cup of water or 8oz of water. Hi Keri. I’d brown the meat first on Saute, or in a different skillet and then just put all ingredients in Instant Pot and cook on Manual/high pressure for 10 minutes. You can Quick release or Natural release the pressure. It shouldn’t really matter and just depends on how soon you want to eat. I hope that helps! Hi, do you think kidney beans could be a good replacement for chili beans? Just thinking that’s what I have on hand at the moment. Recipe looks super yummy! Yummy! Can’t wait to try!! I will probably substitute the kidney beans for an equal mix of black beans and pinto beans 🙂 thanks so much! Does this turn out thick enough that you could dip tortilla chips in and eat it that way instead of with a fork/spoon? On the taco soup, do i drain the corn and beans etc? Hi there, Do you have any idea for a substitution for rotel? I am in Canada and we don't have it in stores here? It's diced tomatoes and green chilies, do you have anything like that? Or you could just do diced tomatoes if you don't. or a can of diced tomatoes and a can of diced green chilies. Hi Rachel, not a dumb question at all, I meant to add that to the recipe, I'll have to go back and update. Yes, I do always cook my ground beef first. I think it's fine if you don't, because obviously the crockpot will cook it, it may just be in bigger lumps. Also, I've seen ground beef cooked in the crockpot still be a little red…for some reason, even though it's fully cooked. I hope that helps! 🙂 Thanks for stopping by my blog! Ok, I've got a dumb question for you. On your recipes that call for ground beef, do you cook it before combining with the other ingredients for the freezer?